Galen, J. v. and Blume, J. v. (2013). 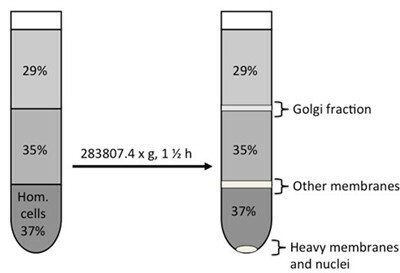 Enrichment of Golgi membranes from HeLa cells by sucrose gradient ultracentrifugation. Bio-protocol 3(18): e906. DOI: 10.21769/BioProtoc.906. von Blume, J., Alleaume, A.-M., Kienzle, C., Carreras-Sureda, A., Valverde, M. and Malhotra, V. (2012). Cab45 is required for Ca2+-dependent secretory cargo sorting at the trans-Golgi network. J Cell Biol 199(7): 1057-1066. This is a protocol to extract intact Golgi Membranes from HeLa cells using sucrose gradient centrifugation. This extraction is very useful for several applications including pull-down of Golgi membrane proteins, electron microscopy and reconstitution of protein transport into an isolated system. Protocol adapted from Balch et al. (1984). Remove medium and wash cells 3x with PBS and 1x with Breaking buffer (BB). Harvest the cells by scraping and pellet the cells (for instance at 300 x g, 5 min). Wash pellet 2x in PBS centrifuge cells at 300 x g, 5 min. Wash 1x in ice-cold BB. Dilute the pellet 1:5 in ice-cold BB. Homogenize pellet with an EMBL cell cracker 20x on ice. Note: Make sure there are no air bubbles during the homogenization. Mix a few μl of homogenate with a trypan blue solution on a glass slide and cover it with a coverslip. Check homogenization by microscope. Note: Plasma membrane should not be intact anymore. Cell nuclei should stain blue with Trypan Blue. There should be a lot of membrane fragments and particles in the homogenate, but the nucleus should stay intact. Check the sucrose concentration to 37% +/- 0.5% with a refractometer. Sucrose gradients: solutions are w/w%. Check pH of the solutions after dissolving the sucrose. Note: Homogenate at the bottom, then add 35% sucrose, then add 29% sucrose. Centrifugation: SW 40 Ti Rotor, centrifuge for 1.5 h at max speed (x g) at 4 °C. Pull the Golgi band in 0.4 ml using a 1 ml syringe with 20/21 G needle (the Golgi band is located at the 35%/29% sucrose interphase). Measure protein concentration and the functional Golgi membranes can now be snap frozen in liquid N2 and stored at -80 °C. Avoid salts/ions in the homogenate as it may aggregate the organelles. Addition of high amount of sucrose affects the pH. Proteases can leak out of the lysosomes. Broken organelles can reseal with other broken organelles. DNA can be released from nuclei which makes the sample sticky. The isolated Golgi membranes are in a buffer containing about 30% of sucrose. Therefore, if Golgi membranes need to be pelleted for further analysis, the sucrose needs to be diluted out by addition of 3 volumes of an appropriate buffer such as PBS. Note: Check all sucrose solutions with refractometer index and % of sucrose. The protocol was adapted from the original version published by Balch et al. (1984). Balch, W. E., Dunphy, W. G., Braell, W. A. and Rothman, J. E. (1984). Reconstitution of the transport of protein between successive compartments of the Golgi measured by the coupled incorporation of N-acetylglucosamine. Cell 39(2): 405-416.
hello, I wanted to ask you how did you do your calculations for the sucrose solutions I know it is basic calculations but I don't really get the same numbers so if you can tell me how I would be grateful.